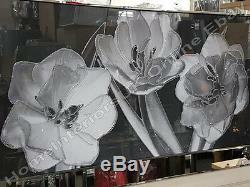 Gorgeous 3 white flowers & black glass picture with liquid art, crystals & mirror frame. Wow wow wow Beautiful things for a beautiful home! This classy, vibrant flowers picture is made complete with crystals, liquid art & a mirror frame, crystals on the flowers and a shimmer of glitter through the flowers. This stunning picture would look absolutely fantastic in your living room, dining room, and hallway or even in your bedroom! What a fantastic gift for that someone special or a treat for yourself! Overall size including frame L. Note: We have an extensive variety and sizes of pictures. These pictures are handmade, therefore each picture has variations as to where the shimmer & crystals are put. Hence, the picture may not be identical to the profile picture. Please if unsure contact for further details. The orders are always collected from us between Monday and Wednesday. 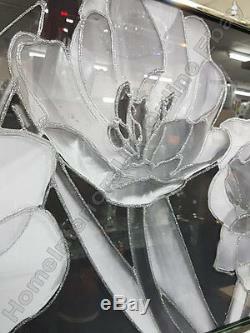 Due to the nature of the product/s being handmade, once ordered can take up to a week to get made before the showroom has a chance to dispatch the items. Sometimes specific goods are in stock in the showroom. Unless/otherwise, the goods are unavailable, they have to be made. 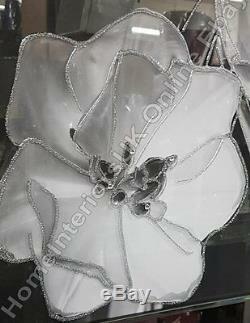 3 white flowers & black glass picture with liquid art, crystals & mirror frame. Return posting costs will be at your expense. Please check this listing page carefully as the answer is usually there. For any further queries contact sales. 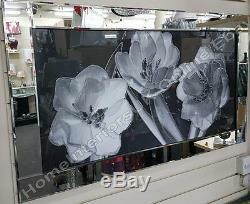 The item "3 white flowers & black glass picture with liquid art, crystals & mirror frame" is in sale since Saturday, May 13, 2017. This item is in the category "Home, Furniture & DIY\Home Decor\Wall Hangings".